The diagnosis of cancer in your pet can be devastating. However, cancer doesn’t necessarily equate to a life sentence. Depending on the type of cancer, different treatment options may be available, which may either be curative or palliative. 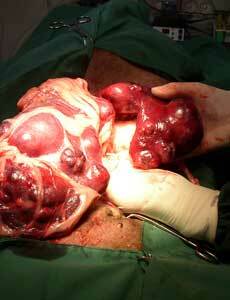 Surgery can be performed to remove the tumour. Sometimes a large amount of tissue needs to be removed and reconstructive surgery may be required for a more cosmetic appearance. Chemotherapy is being used more frequently in veterinary medicine. It involves the use of medication, which may be in the form of injections or tablets, which kills the cancerous cells. Contrary to popular belief, it is rare for pets to lose their entire hair coat as result of the medication, and some pets do not develop side effects at all. Referral to a specialist oncologist may be required for other treatment modalities.